These ingredients got old fast so I had to become creative. Traditional cabbage rolls slathered in tomato sauce is one of my favourite dishes. 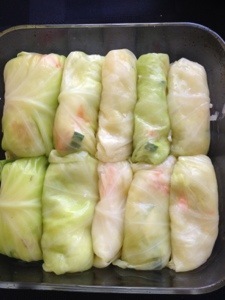 That being said it did not take me long to come up with cabbage rolls. 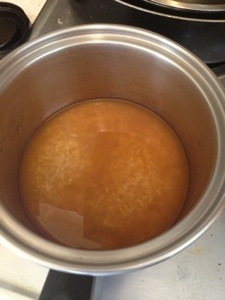 Start a pot of water to boil. Make sure this is big enough for your head of cabbage. Sweat your onion and garlic in your coconut oil. 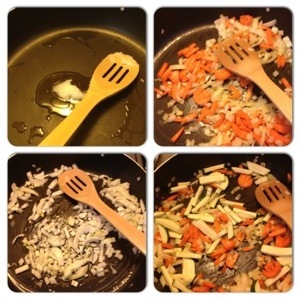 Dice up your carrots and zucchini to tiny pieces and add to your Pan with onions and garlic. 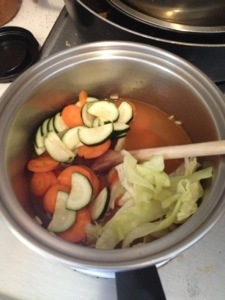 Cook until the carrots turn bright orange. This only takes a few minutes. They will cook once more so be careful not to fully cook these yet. Add this mixture to your cooked rice and set aside. Your pot of water should be almost ready. Fill a second bowl with cold water and ice cubes. 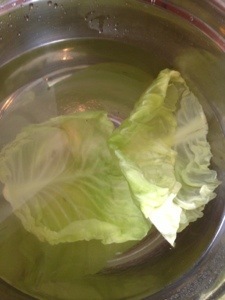 Take your cabbage and peel back the first layer and cut out the core. Place the whole head in the boiling water. 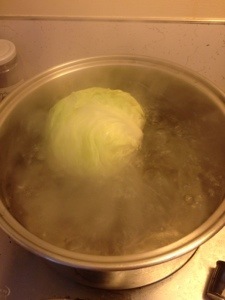 You will notice that the leaves will separate from the head of cabbage. This is when I took then out and put into a cold bath. 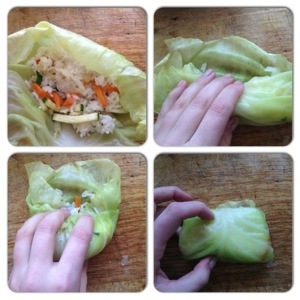 Do this until you have no cabbage left. I’m not sure how necessary the cold water bath was but I know it will stop the cooking process so they don’t over cook and I thought handling would be easier with them not burning hot. As your carrots cook lets get to the rolling. To be honest I’ve never made cabbage rolls ever so I’m pretty proud about how I managed to make these work. As you can see I just used a square baking dish to put the rolls in. By now your carrots are probably ready. Transfer the whole pot into a blender. Set to purée mode and go to town. If its not blending add more broth a tablespoon at a time. Now your ready to slather this on your pro skill cabbage rolls. You can put this in your oven now or later. Make sure it’s 350 for about 30 min. Sorry for not posting over the weekend. I was way to tired at the end of the nights and just didn’t feel like it. I can tell today that PMS was to blame for my defiance in posting lol. Well I hope that every one had a wonderful weekend. I came to a few tough situations socially. 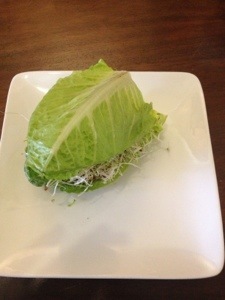 Here is my delicious “burger” wrapped in lettuce instead of a bun. I urge you to check it out if your in the area. So Saturday night Matt’s friends invited us over for a BBQ. I was devastated. 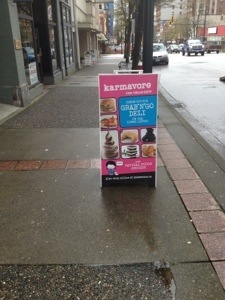 I went but ate before hand. We needed to bring an appetizer so that is why I made my bruschetta..,which I could not eat. Matt was nice enough to inform the hosts that I had to eat before hand for health reasons. I had hoped no one would notice I wasn’t eating but of course everyone did. So now instead of blending in I was on spotlight. I didn’t want to elaborate about my ulcer but I got “..the foods not good enough? ?” from one of the guests, followed by a laugh to make a joke but I still was upset about someone thinking that about me. So to save my reputation I had to explain. I had never met these people before and didn’t want to come across as some yuppie who is better than anyone. After this situation I faded in, which in my embarrassment was perfect for me. The other hardest part is all the food there. It all looked so good. I had eaten at 430. Everyone else ate at 7. By this time I was hungry and thinking I should have packed a snack. By the time 10rolled around when we left I was starving! I’m sure partly psychological because everyone else was eating the entire night except me but none the less I was starving. I bunged in almonds when I got home. Not a good idea being close to bed but I did anyway. So that’s most of the exciting notes worth noting about this weekend. Have you found yourself in these type of situations? How do you handle it? I made this bruschetta recipe yesterday for a potluck BBQ at some friends house. Unfortunately due to my stomach conditions I could not eat this. Matt was my taste tester so I trust his word. It was well received at the potluck as well. 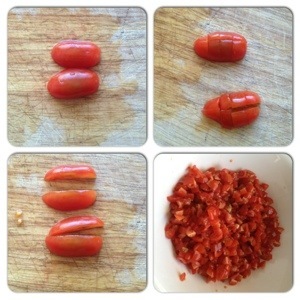 Start by cutting your tomatoes. I like them quite small. I dislike finger appetizers that fall all over the place. 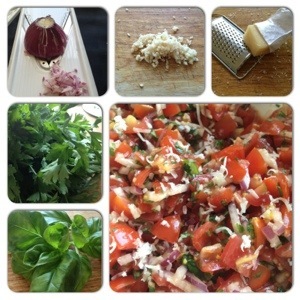 I find finely chopped bruschetta is easier to handle. Next, I used a mandolin for the onion. I also hate huge chunks of onion all of a sudden in your mouth. It can be overwhelming. Then mince your garlic. I just use a sharp chefs knife to make it small. Like onion it can be overwhelming when to large. I love fresh herbs and they make this recipe. If you use dried its honestly just not the same. If you roll your herbs in a ball and cut them that way it’s a lot easier. Chop your herbs fine as well. Originally I did not add the Parmesan cheese. After Matt tasted it sans the cheese he suggested adding it. Since its salty in itself I did not add salt to this recipe. *Tip: if you grate your cheese with the fine grater it goes a lot farther. You won’t end up using as much cheese. This is both useful for your bank account as well as your calorie count. After you add the cheese cut your lemon and squeeze into the mixture. You can always add more as you need. Now that its all in a bowl you can mix it all up and let it sit for a few hours. This helps all the flavours meld together. You can use a lot of different things as a vehicle for your bruschetta. As a kid I used to put in on toast or a bagel. 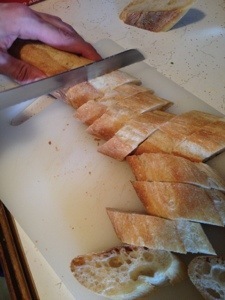 Last night we just cut some baguettes cut on an angle. We opted not to toast the bread but you could, just be careful not to over do it otherwise you’ll have raw gums trying to bite into it. Once your ready,spoon your mixture onto your bread. Don’t do it too soon. The bread could become soggy if it sits too long. This recipe can be gluten free and it’s ulcer friendly. 1cup + 4 cupsHomemade (or low sodium organic) veggie broth. While rice is on simmer chop your veggies as you wish. I like a chunkier soup so I made my veggies bigger. 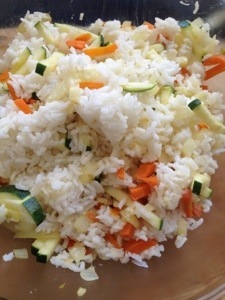 Once rice has parboiled and veggies are cut add 4 cups of veggie broth. Bring temperature higher an bring to a light boil. Add veggies and simmer for 10 min. Week is almost over….for most people anyway. I get home at 11pm on Thursdays and I pre made lunch for today. Forgive me, I did not post yesterday. Yesterday was a great day. I woke up at 7 and did choreography till 2. 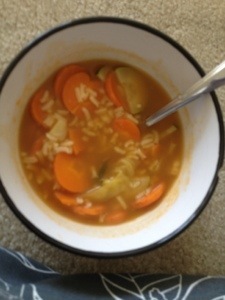 I did pause for my usual breakfast routine and lunch which was veggie soup. After this I was early for dance so I took a walk along the water and enjoyed Mother Nature. She’s not PMSing so we have been pretty lucky. I had dance again today 🙂 a lyrical, tap and jazz class. I was definitely ready for bed after all of that. I barely remember even getting Into bed. Overall it was a nice day. I was able to relax and enjoy life in the most simple things. I could have taken the bus to dance but I decided to walk and I’m so glad I did. Was it sunny and beautiful where you were? How did you enjoy Mother Nature today?